When civilians and police officers came under fire late Thursday night in Dallas, state officials live-tweeted the latest news, offered prayers and lamented a peaceful protest warping into a shootout between snipers and law enforcement. North Texas-area lawmakers were some of the first officials to pick up the incident, which happened during one of several protests around the country in response to police fatally shooting Alton Sterling in Louisiana and Philando Castile in Minnesota. Their deaths sparked national outcry about black individuals dying at the hands of law enforcement. State Rep. Ramon Romero Jr., D-Fort Worth, was one of the first lawmakers to tweet regular updates as Dallas police and local news outlets released information, including as the death count rose and misinformation about a person of interest confused media outlets and people online. Mark Hughes turned himself in after being called a suspect by media, while @DallasPD only called him a POI. Other officials expressed disbelief, called for peace and criticized President Barack Obama. 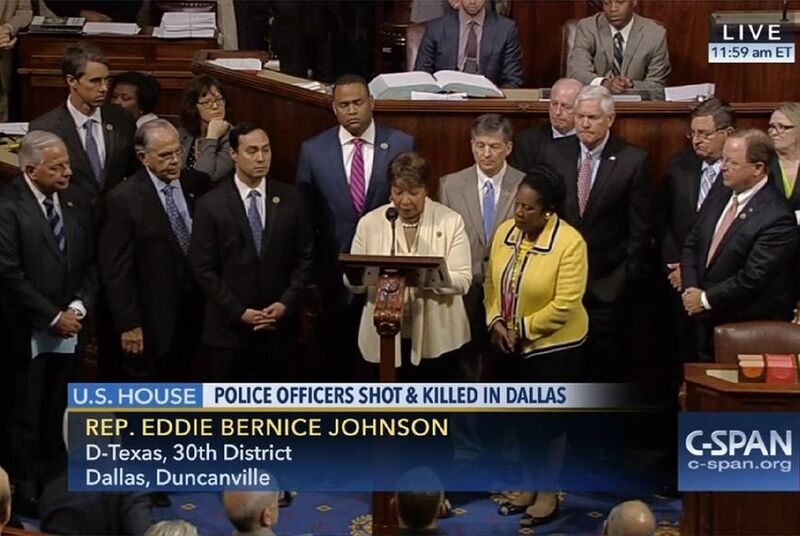 Democratic U.S. Rep. Eddie Bernice Johnson, whose congressional district includes downtown Dallas, later delivered a speech on the floor of the U.S. House, flanked by nearly the entire Texas congressional delegation. "The calculated ambush and murders of the Dallas law enforcement officers during a peaceful protest in downtown Dallas last night was a disgraceful act of violence," Johnson said. "It happened in my district. I live less than five blocks away." Along with praising Dallas law enforcement involved in the response to the attack, Johnson called on Congress to pass "meaningful legislation that will help bridge the divide between law enforcement and communities." President Barack Obama spoke about the attack from Poland, calling it a a vicious, calculated and despicable attack on law enforcement." "We also know that when people are armed with powerful weapons, unfortunately it makes attacks like these more deadly and more tragic," Obama said. "And in the days ahead, we’re going to have to consider those realities as well." U.S. Rep. Louie Gohmert, R-Tyler, took issue with Obama's touching on gun control so soon after the attack. "He doesn't know what all guns were used," Gohmert said in an interview on Fox Business. "They don't even know who all the suspects were and yet he's already calling out guns." Gohmert also called Obama "divisive" in his handling of tensions between African-Americans and law enforcement. "Every time he has taken - there's been a tragic shooting by police, he has taken the chance to call out police," Gohmert said. Both Gov. Greg Abbott and U.S. Sen. John Cornyn offered prayers and assistance in statements, and Sen. Ted Cruz tweeted prayers and support for law enforcement. "My condolences are with the families of the officers who lost their lives in last night’s horrific attack, and my thoughts continue to be with the injured and those in the Dallas area affected by this unspeakable tragedy," Cornyn said. "Our law enforcement officers put themselves in harm’s way every day, and to target those who serve and protect our community in such a senseless and vicious way is shocking and reprehensible," Cornyn said. Texas Attorney General Ken Paxton tweeted that his office is ready to help with the investigation. Early Friday morning, Dallas Police Chief David Brown said officers were negotiating and exchanging fire with a suspect who said "the end is coming," bombs are laid throughout downtown and that they would continue to attack law enforcement. Brown said he is not confident that all suspects have been found. Dallas Mayor Mike Rawlings said the city would need help from Abbott's office. Abbott's office said in a subsequent statement that he spoke with Rawlings and that he is cutting short an out-of-state trip and heading directly to Dallas. Lt. Gov. Dan Patrick offered his own remarks early Friday morning, urging Texans to stand united as the investigation continues and to "pray for the families of the officers killed and wounded in the line of duty in this horrific attack." "This is not just a Dallas tragedy, but also a Texas and an America tragedy," Patrick said. The two leading presidential candidates also weighed in Friday morning. Democrat Hillary Clinton tweeted that she mourned "the officers shot doing their sacred duty." Republican Donald Trump called the shootings "an attack on our country." For more on this story, see President Obama’s remarks on the Dallas police shooting.